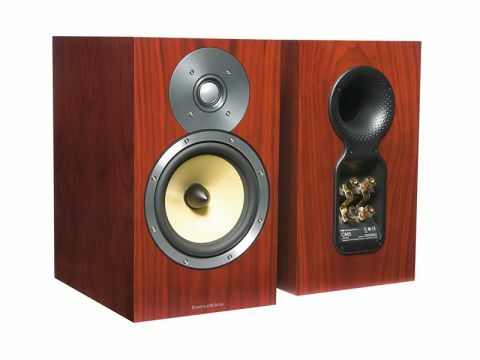 The request from the Bowers and Wilkins marketing team to the engineering department responsible for the CM5 loudspeaker, probably went along the lines of "make us something small, simple, beautiful and affordable". So it did! At £800, it doesn't come cheap, but it is unquestionably delightfully designed and beautifully finished and a vast improvement over the 685 model, which incorporates many ostensibly similar core ingredients at around half the price, yet which is dressed in clothes that even its friends would call nondescript. And that's certainly not the description one would apply to the CM5. But its virtues aren't entirely superficial. Compare the specifications of the CM5 with those of the 685 and you'll notice that although the latter is somewhat larger, it's also significantly lighter in total weight, indicating that that the CM5 benefits from rather more substantial build. Impressive build Indeed, one soon becomes aware that the CM5 is significantly heavier than expected from the moment that you lift it from the carton. Clearly then, there's rather more to this speaker's engineering than is apparent on the surface. A surface that is, mind you, very attractively decorated. Who knows whether our sample was finished in either Rosenut or Wenge real-wood veneer, as we've never encountered a Rosenut or Wenge tree, but in the world of faking-up an attractively stained and grained-looking surface from whatever wood happens to be available at a sharp price, this works very well indeed. It also comes in a silky satin finish or high-gloss black. The sharp-edged enclosure looks chunky and compact, while the front panel is brightly decorated by a thin silver trim around the bass/mid driver and a much wider faceplate around the tweeter – part of which is cut away in order to place the tweeter closer to the bass/mid unit. The back panel accommodates twin terminal pairs – one of which proved rather too tight for one of our four-millimetre plugs. Above the terminal block and integrated into the same substantial moulding, is one of Bowers and Wilkins' proprietary Flowports, a generously dimensioned flared port with a stippled 'golf ball' surface to improve airflow and minimise turbulence. Another clever innovation concerns the supplied foam bungs, which come in two parts. The whole bung may be inserted into the port to convert the speaker into a sealed-box mode of operation, or the centre of the bung may be removed to re-tune the reflex loading to a different (and rather lower) frequency. The idea here is to provide an option, should the naked, open port tuning coincide and reinforce a significant room mode. Since the 'natural' port-tuning frequency at around 48Hz is very close to a major mode in our listening room, this option to lower the tuned frequency to around 40Hz proved very useful. The 'fully blocked' option would be particularly useful if circumstances dictate that the speaker has to be sited quite close to a rearward wall. The driver complement follows classic Bowers and Wilkins practice, by combining a 165mm bass/mid driver equipped with a Kevlar cone and a 25mm aluminium dome tweeter. The virtues of Kevlar lies in its smooth and controlled breakup and the way the sound source automatically becomes smaller as frequency rises. One point of criticism regarding the Nautilus tube that loads the back of the tweeter diaphragm is that it's unquestionably vulnerable, especially to young children. While there's no denying the accurate pistonic action of a thin metal dome, unlike a doped fabric tweeter it's easily damaged, especially by small inquisitive fingers. Protection is only provided during transit, as there's no mesh over the diaphragm here and the main grille is just a thin-framed fabric affair, held by hidden magnets. Do spend time experimenting with the positioning and port options. For example, placing the speakers on 60cm stands and leaving the ports completely open and unobstructed did result in some bass 'thump' in our room, even with the speakers well clear of the nearest wall. Under our listening room conditions, the CM5 arguably works best of all when well clear of walls and with the foam sleeves in place. Under these conditions there is still some unevenness through the bass region, but it is less severe and the compromise seems rather better judged overall. However, blocking the ports completely and placing the speakers as close as practical to a wall also achieves a very decent overall bass alignment and many users will doubtless prefer the lack of intrusion into the living space afforded by such an arrangement. It's a close call, as the speakers still sound pretty good under these conditions too, maintaining a similar overall character with fine bottom-end drive and purpose, although wall proximity does interfere a little with the midband, adding a little 'cupped hands' coloration and somewhat inhibiting the image depth and transparency. Most of the listening was done with the port sleeved and the speakers sited in free space, using top-quality vinyl, CD and radio sources from Linn/Rega/Soundsmith, Naim and Magnum Dynalab respectively, plus Naim amplification. Helped by its generous sensitivity, good bass alignment and solid build, the CM5 can be driven to impressively high levels, without creating any unpleasant drama. That substantial enclosure helps ensure minimal box coloration, while also delivering a wide dynamic range with low level resolution and crisp low frequencies. The midband voicing of any loudspeaker is invariably a matter for taste and discussion, as human hearing doesn't behave in a linear fashion. The speaker that gives good voice articulation at whisper-quiet levels will tend to sound rather fierce and astringent as the volume is steadily increased, to the point where it can sound rather uncomfortable when operating at high volume levels. By the same token, a speaker like this CM5 that enjoys being driven hard and to high levels, is liable to make voices sound a little 'shut in'. It also compromises intelligibility when the volume is turned way down. As befits a market leader like Bowers & Wilkins, the CM5 delivers a determinedly middle-of-the-road tonal balance. Some might find its rather restrained presence band reproduction a little too cautious for personal taste, but others will welcome this character because of the way it avoids any unpleasantly aggressive tendencies, even when the speakers are driven hard with the modest quality type of source and electronic components that are appropriate to a speaker such as this. The CM5 is a very well-judged, all-round performer that's well suited to its likely role at the end of a budget or mid-price hi-fi system. While some might find its laid back mien a tad frustrating when listening at late-night levels, others will welcome the ability to wind up the volume without causing irritation. An unusual combination of high sensitivity, alongside an easy load is a worthwhile plus, as is the fine cosmetic presentation that well deserves a 'luxury' label.